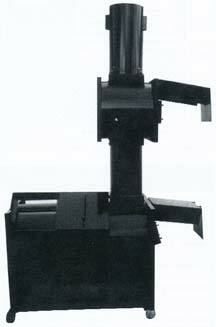 The Destructor Junior Incinerator with secondary chamber is the small incinerator designed with the Poultry Grower in mind! Designed for poultry operations, Destructor Junior S/C requires only a 5' x 5' area for operation to handle 80 to 100 pounds per hour. 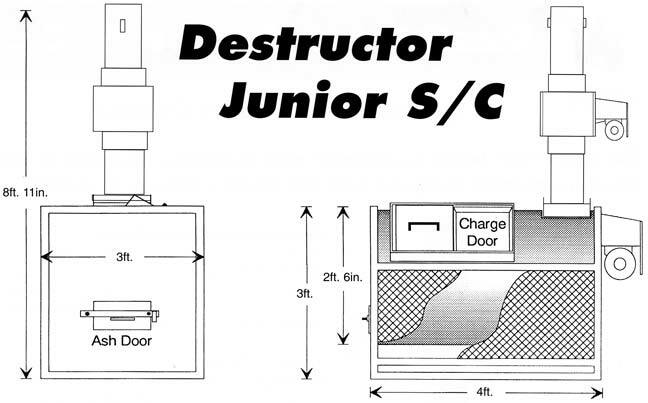 A weatherproof electrical control box means Destructor Junior S/C can be installed indoors or out. Destructor Junior S/C has two re-adjustable gas burners with two 60-minute timers. Natural or propane fuel may be used. In testing, it is estimated that it uses 2 to 2-1/2 gallons of propane per hour. U.S. environmental tests are available upon request. Continued research in new design, laboratory and field tests, and performance evaluations are constantly at work at National Incinerator to improve the operating efficiency of their equipment. 15 years of refinements has made National the leader in Agricultural Incinerators. Customer to connect power and gas to unit. Customer also to furnish pad for incinerator. LP Gas: Low pressure. Minimum 1/2" gas pipe. National Incinerator, Inc. guarantees all materials and workmanship used in the construction of its incinerator and the refractory for a one year period from the date of installation. All purchased electrical parts such as burners, fans, timers, and other controls will carry the applicable manufacturer's guarantee of 90 days. Seller shall not be liable for any injury or damages to person or property or any other incidental or consequential damages. Grates: 1/2" x 2" x 20"
Burners: 100,000 BTU incinimite with cover. 50,000 BTU Second Chamber burner with cover.